In stock - low quantity. Order in the next 1 hour, 55 minutes and it will go out today! Perform miracles with items you can find around the house (and without difficult sleight-of-hand)! 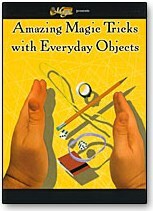 After learning the magic on this DVD you'll be able to make magic with everyday objects just about anytime and anywhere. Predict the rolls of a set of dice! Tear a paper napkin to shreds and then, suddenly, make it whole again! Cause your personal information to materialize on blank business -cards! Make a rubberband penetrate through your flesh!